About 11% of Nepal’s population practices Buddhism, consisting mainly of groups of Tibeto-Burman origin. In many areas, Hinduism has absorbed Buddhism to a large extent, but the two religions have many shared deities and temples. 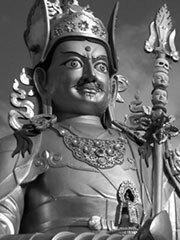 In Muktinath, the temple there is sacred for both Hindus and Buddhists. Though most people in Nepal are Hindu, Buddhist influences are pervasive in most aspects of Nepali culture. Tibetan Buddhism is the most widely followed and the Newar Buddhists practice a particular Newar variant of Vajrayana Buddhism and Theravada Buddhism. Buddhist influences are evident in the culture of Nepal, including that of many Hindu and Animist castes. Due to Nepal’s close proximity to Tibet, Tibetan Buddhism is the most widely practised form, but the Newar practice Vajrayana Buddhism. Many Buddhist groups are also influenced by Hinduism. Buddhism is the dominant religion of the thinly-populated northern areas, which are inhabited by Tibetan-related peoples, namely the Sherpa, Lopa, Manangi, Thakali, Lhomi, Dolpa and Nyimba. They constitute a small minority of the country’s population. The Kirant tribes, especially the Limbu and the Rai, have also adopted Tibetan Buddhist practises from their Buddhist neighbours. However, the Jirel, which is considered a Kirata tribe, have adopted Lamaism. According to archaeological and historical records, Gautama Buddha, the founder of Buddhism, was born in Lumbini in 563 BCE. His and his disciples’ preaching soon spread Buddhism in the surrounding areas. It is believed that Gautama and his disciple, Ananda, came to the Kathmandu Valley during the rule of the seventh of the 28 Kirati rulers and stayed for a while in Patan, Nepal. Emperor Ashoka from India put up a pillar at Lumbini, the birthplace of the Buddha in the 2nd century BC. It is also believed that Ashoka went to Patan and had four stupas built there. It is believed that his daughter Charumati established the village of Chabahil, which is located between Kathmandu and Bodhnath. There is a stupa and monastery in Chabahil that are said to date back to her time. It is said that upon the expansion of the Mauryan dynasty into the Terai plains in Nepal, Buddhism was adopted by the ancestors of the Tharu and flourished until the resurgent Licchavi repelled its adherents in AD 200.But, in fact, the Tharu are the remainants of ancient Sakya, Koliya, Mourya and many other ancient tribes. Thus, obviously, Buddhism in Nepal has been flourishing since Buddha’s time if we consider ancient Kapilvastu and Devdah in Nepal. Another Buddhist text, the Manjushrimula Kalpa, mentioned Manadeva as the King of Nepal Mandala. Researchers believe the Mulasarvastivadavinaya was written in the 2nd century CE, and that the Manjushriulakalpa was written during Manadeva’s reign. The Swayambhu Purana, the ancient Buddhist Purana text, and a Licchavi inscription all mentioned Nepal Mandala. Buddhist inscriptions and chronicles and Tibetan sources also record a few tantric Buddhist deities, namely Aksyobhya, Amitabha, Vajrayogini, Vajrabhairava, Usnisavijaya and Samantabhadra. Strong influence from Animist cults resulted in belief in Buddhist deities such as the Pancaraksas. Religious tolerance and syncretism were stressed during the Licchavi period. King Manadeva paid homage at both Hindu and Buddhist sites. His family subsequently found expression for their beliefs in various different religions. The worship of the Caitya and the Rath Jatra cart festival of Avalokitesvara were introduced around this period. Many ancient sites in the Kathmandu Valley were identified with major Buddhist Caityas, such as Swayambhunath, Bodnath, Kathmandu and the four «Ashoka» stupas of Patan, and another two hundred stone caityas dating from the Licchavi Period, were testified to the widespread antiquity of caitya worship. Caitya worship was an important factor in bringing more of the proto-Newar tribal inhabitants into the Buddhist fold, as it was a devotional practice designed for the general public. Thus, the masses probably began practicing the cart festival of Avalokitesvara/ Matsyendranath (Bungakya) during the latter half of the seventh century A.D. This festival was celebrated by hundreds or even thousands of people, who helped to construct and transport a huge, wheeled cart that bore the image of Avalokitesvara for several days or weeks along a specific route. The introduction of this festival must have been an instant success among the majority of the Kathmandu Valley population. This strengthened Buddhism’s standing in relation to the other Hindu and Animist faiths of the Valley at the time. Inscriptional evidence also proves that there was a string of traditional methods of making religious gifts. These offerings were used for earning blessing and making merit, and the women of the Buddhist seem to have taken the lead in offering these gifts. Strikingly, parallel points within the Buddhist cave contain inscriptions of Maharastra, which predated the Licchvi Nepal. The references in the Licchavi inscriptions to the Mahayana and Vajrayana will be mentioned below in connection with Buddhist art and notable Buddhist figures of the Licchavi period. The first Thaukri king, Amsuvarma, married his daughter Bhrikuti to the ruler of Tibet, King Songtsen Gampo. According to legend, she received the begging bowl of the Buddha as part of her wedding dowry. It is believed that she is a reincarnation of the Green Tara of Tibetan Buddhism, who is seen in many Buddhist Thangkas. The Malla dynasty saw to the golden period of the syncretism of Hindu and Buddhist art forms by the Newar. The Paulbha, the Newari counterpart of the Tibetan Buddhist Thangka, flourished in this period. Modern Newar Buddhist practises in Nepal have largely been absorbed into mainstream Hinduism, although certain distinct practises, artforms and castes do remain. In the north, people of Tibetan origin continued to be the much-unchanged practises of Tibetan Buddhism, especially in the case of the Nyimba of Northwest Nepal. On the other hand, the Thakali, who had traditionally played an important role in the Nepali society but yet retained Tibetan Buddhism, have begun to embrace Hinduism as well in the recent years. Tourism is another important factor for promoting Nepali Buddhism to the world. Every year, Kathmandu can receive more than 10,000 travellers from all over the world just to visit the Boudhanath and the Swayambhunath stupas.